Christian Esquevin, director of library services for the city of Coronado, has been named the 2016 Coronado Citizen of the Year by Coronado Private Bank. Under Esquevin’s leadership over the past 28 years, the library has been on the leading cusp of technology as well the heart of Coronado’s cultural experiences. “Christian Esquevin has been a gift to this community,” said Coronado Private Bank’s Chairman Steve Rippe. “Under his steady leadership, Christian has built our library into a leading technological hub that also maintains cherished traditions. Coronado Private Bank has been honoring individuals who contribute to the fabric of life in Coronado since the bank was founded in 2005. Past recipients have included Tom Smisek, Doug St. Denis, Mary Sandermann, Spiro Chaconas, Dan Gensler, R. G. Head, Stephen Wampler and Bob Watson. Esquevin, a native of France who moved with his family to Los Angeles when he was four years old, holds a bachelor’s degree in anthropology from California State University Los Angeles and a master’s in library science from the University of Southern California. At USC, he met fellow library science student Sydney Stanley, who hailed from Coronado, and the couple married in 1977. 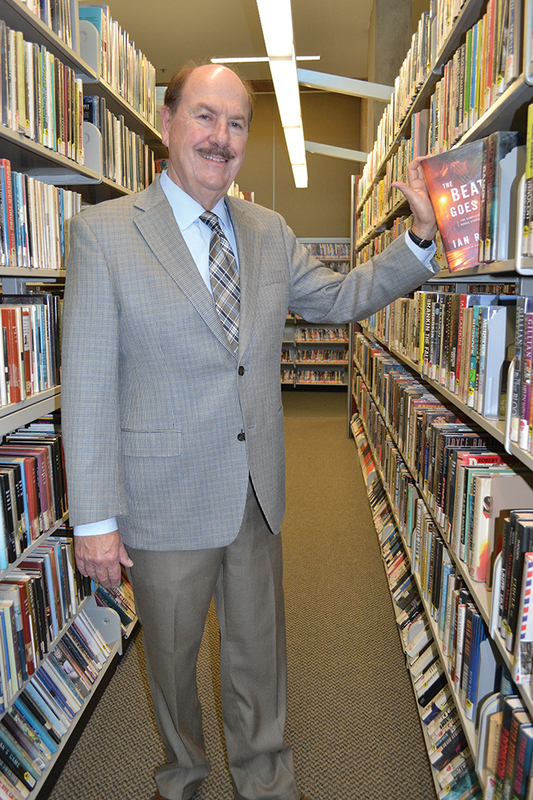 Esquevin began his career with the San Diego County library system where he began as a reference librarian and ended as a regional library manager. After he assumed the directorship of the Coronado Public Library in 1988, it didn’t take long for Coronado citizens to recognize that Esquevin was a dedicated visionary. A year after joining the city, Esquevin created a yearlong schedule of special programming to celebrate the library’s centennial in 1990; it captured the John Cotton Dana National Public Relations Award. The centennial programming included a host of special events and eight lectures including presentations by author Ray Bradbury, Adm. James Stockdale, Disney President Frank Wells, Los Angeles Times columnist Jack Smith and noted children’s book author Verna Ardema. Esquevin next led the campaign to expand the library, which took 10 years of planning to get to the construction phase. He started the ball rolling by doing a needs assessment document and convincing the library board of directors that the library needed a major expansion. A committee, chaired by board member Ben Cohen, was appointed with board members, citizens and library staff members including Esquevin. The 40,000-square-foot expansion, which opened in 2005, nearly doubled the size of the facility. The expansion allowed Esquevin and the library board to accomplish another major goal: bringing the Alfredo Ramos Martinez murals into the library. “It had been a particular goal of mine to add the El Dia del Mercado mural to the library,” Esquevin said. “This 48-foot-long mural had been offered to us by Gus and Barbara Theberge via Mayor Mary Herron before the old La Avenida restaurant was torn down. “We didn’t have enough wall space to accommodate it. At the time our walls were mostly glass, so we had to decline the offer. It was then given to the city and placed in storage. When we began our actual space planning, I made sure that the architects planned for the mural to be in a prominent space.” Today, it backs the library’s front desk, and architects cut out doors to mirror the cutouts of the original mural. Then Esquevin discovered that Martinez’s Canasta de Flores mural, which had also been part of the La Avenida restaurant but covered for years, was for sale in Los Angeles. He asked the library board and then the Friends of the Library if they could purchase it, and they enthusiastically agreed. Esquevin is also proud to point to the library’s e-books and e-magazines that can be downloaded, audio books and movie rentals, plus its availability of the highest computer speed and bandwidth in the city. He also points to an increasing variety of digital content including various databases, from financial data to health to telephone directories to Ancestry.com. There are also digitized historical photos and a Coronado PhotoAtlas that links local addresses with any historic al photos. And, after several years of planning, Esquevin is proud to say the library has completed the digitization of its microfilm collection of Coronado newspapers (the Coronado Eagle-Journal, the Coronado Journal, the Coronado Mercury and others) going back to 1887. “This was made possible by a generous bequest and with the cooperation of Dean Eckenroth and the work of the University of Riverside’s California Digital Newspaper Collection,” Esquevin said. Esquevin notes that the library continues to offer many timeless services such as story times for toddlers and preschoolers, crafts and after-school teen activities, cultural programs such as lectures, concerts, film showings, Friday lunch piano concerts on the Steinway (added in 2008) in the Winn Room, and an annual summer festival. “We also have book clubs and a place for people to study, enjoy our artworks and view our exhibits,” Esquevin added. Esquevin supervises the Exhibits Gallery’s rotating shows — a new one approximately every two months that have ranged from military-themed exhibits (World War I and World War II, Naval aviation history), Navy UDT and SEAL teams; popular nostalgia such as Charles Schultz cartoons and memorabilia and the art of Norman Rockwell and N.C. Wyeth; local photographers; the Coronado ferries; and the Wizard of Oz, among them. In 2010 and 2011 Esquevin chaired a planning group that grew to 35 people representing multiple organizations and agencies to celebrate the centennial of naval aviation in San Diego and Coronado. Because of the library’s lead in the extensive planning, an open house at North Island Naval Air Station, not previously planned, was held. Esquevin is a devotee of classic movies, fashion and costume design that traces its origins to his great aunt Marie Ree who was employed as a head cutter-fitter in the wardrobe department at RKO Studios. There she made the costume patterns and fitted costumes on Katharine Hepburn, Ginger Rogers, Lucille Ball, Maureen O’Hara and many others. Esquevin inherited more than two dozen costume sketches from her (done by various designers) and he’s multiplied his collection tenfold, which he has shared in the library Exhibits Gallery. His interest in the film industry has manifested itself in several dimensions. In 2008, he authored a book of the famed costume designer Adrian and he has another book in the works. 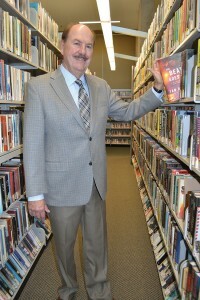 He is a board member of the Coronado Island Film Festival, and the library served as a venue for the inaugural film festival. Additionally, the library’s Winn Room was the site of the “Filmed in Coronado” series, dovetailing nicely with Esquevin’s interests in classic films. His blog, Silver Screen Modes, covers classic movie costume design and fashion, with some of his posts covering the classic films, Sunset Boulevard, Casablanca and Singing in the Rain. For his blog, he has interviewed Larry McQueen, a major collector of Hollywood movie costumes and Jean-Pierre Dorleac, the costume designer for the TV series Battlestar Galactica and Matlock, and the movies Blue Lagoon and Somewhere in Time,” Esquevin said. Esquevin is also the recipient of the “Jewel in the Crown” award in 2008 from the Coronado Historical Association and is a 28-year member of the Optimist Club of Coronado. His hobbies extend to cooking, collecting antiques and Hollywood memorabilia, occasional travel to France where he still has relatives, walking, and, of course, reading. A reception honoring Esquevin will be hosted by Coronado Private Bank at its headquarters at 801 Orange Ave. shortly after the new year. For an invitation, call Richard Rico at the bank at (619) 522-2509. 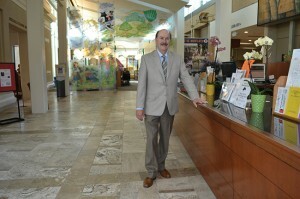 Christian Esquevin has been at the helm of the Coronado Public Library for 28 years.